In this video, Loqate Director of Engineering Uma Ramamurthy and Product Manager Elie Challita take the time to discuss the new features of the Q1 release which include improvements to verification and title casing, an introduction to the new transaction logging capability and Address Quality Index Field as well as a mention of our new premium India data. In 2014Q4, we introduced a new hash index for the US. In 2015Q1, the hash index was extended to Germany and China. The hash index is built to support faster verification for addresses that match the reference data exactly. Other countries may be supported in future releases. The hash index helps improve verification performance significantly on input that matches reference data. Every API call that involves a Loqate process can be considered as a transaction. In this release, we introduced the capability to have the transactions logged to a file. The file name will be trLog.lfs and will be located in the data folder. If the file size exceeds 10 MB or if the file is more than one month old, the file will be backed up under a different file named based on the date of creation of file viz., trLog<date_of_creation>.lfs. For example, if the original transaction log was created on January 3, 2015 at 12:00:00 am, the file will be named trLog20150103120000.lfs at the time of backup. The transactions will also be available via the API through the ProcessResult object. For each transaction, logging will record the time stamp of the transaction, name of the processes and name of the country involved. The actual input or output address will not be recorded in the log. Transaction logging is controlled through a server option. This option is described in further detail in the New Server Options section below. In 2014Q4, intelligent title casing was introduced for the US and Australia. This feature resulted in output having proper casing for all verified fields. This feature has been extended to all countries in 2015Q1. This includes upper-cased Roman numerals and upper-cased directional words. In this release, a new field was introduced in the verification output. This field is useful as a quantitative indicator and can be used to make decisions on the address quality. This field is computed using a combination of the post-processed verification level and match score. 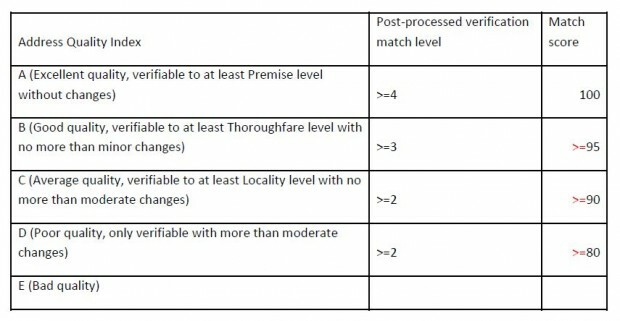 The following table indicates how the value of the address quality index field is computed based on the row at which the AVC code and match score together satisfy the stated conditions. For example, consider an address reported to have an AVC code of V33-I44-P6-100. From the above table, walking through the rows from the top, the second row satisfies the condition. Hence this address will be classified to have Address Quality Index B. In this release, we introduced premium data for India. Premium India data provides better verification and geocoding than regular India data. This data is available through separate product codes (DSVINDP, DSGINDP and DSPINDP for Verification, Geocoding and Address Powersearch, respectively). This option allows the user to enable/disable transaction logging. If the option is set to ON or 1, transactions will be logged. If the option is set to OFF or 0, transactions will not be logged. This option allows the user to control logging of transactions and availability of transactions through the API. The default is OFF. The option should be set to 0 or OFF to prevent any logging of transactions. The option should be set to 1 or ON for enabling the logging of transactions to a file on disk and also making the transaction log information available via the API. Please visit http://support.loqate.com/support/releasenotes/2015q1cases for a list of cases resolved in this release. Sometimes the case descriptions we are supplied with can be difficult to understand, so please contact support@loqate.com for further information about any solved cases. The Loqate Cloud will be updated to 2015Q1.0 along with the general release. Please visit http://support.loqate.com/support/releasenotes/2015q1cases for a list of new features available through our Cloud APIs. We are continually improving our country data and rules/lexicons to support them. Please visit http://support.loqate.com/support/releasenotes/2015q1cases for a list of cases involving improvements and enhancements for a particular country. The table below shows which countries have been enhanced, and how, in this release. Many answers to your questions may be found in our support pages. Please make sure to register at: http://support.loqate.com/wp-login.php?action=register so that you may have full access to all technical information on our website. If you have a general question or if you have an issue or enhancement request you would like to report, please fill out the web form to submit a case at http://support.loqate.com/support/file-a-case/. If you still have questions, please contact Loqate Support at support@loqate.com or your account manager. ™Loqate and EverythingLocation are trademarks of Loqate, Inc. All other trademarks are the property of their respective owners.